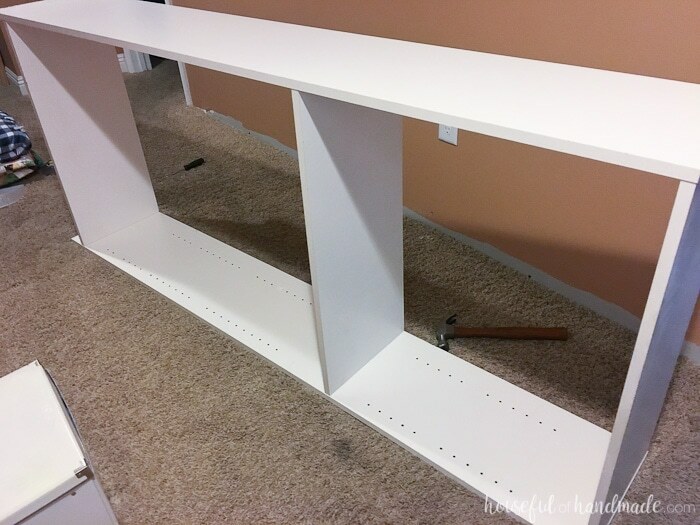 See how I transformed inexpensive bookcases ready for the trash into the perfect rolling work table. When I finally managed to snag my very own space for all my creativity, I knew the one thing I really wanted was a rolling work table. Having a big table to work on all my DIYs seemed like heaven to me. No more need to take over the dining room table! But with my $100 budget for this room, I had to get creative. 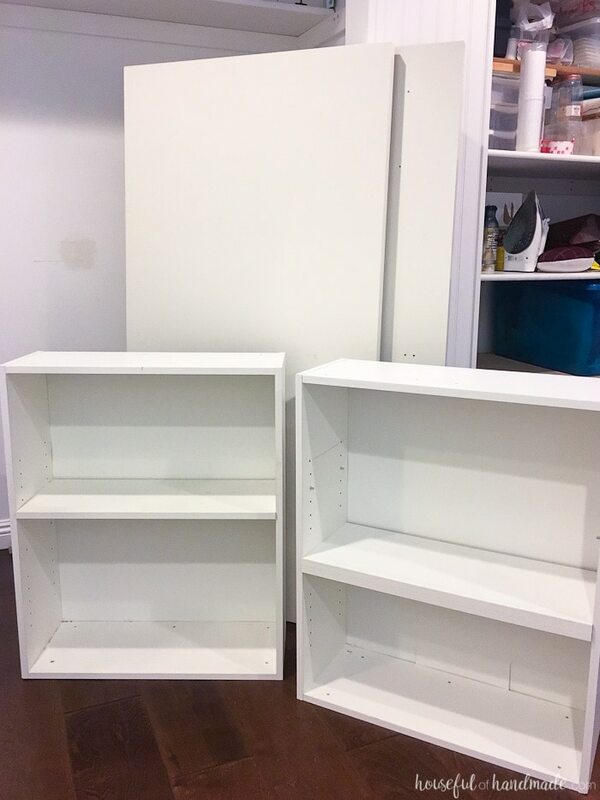 I happened to have a few cheap melamine bookcases laying around that I didn’t want anymore. From them I created the perfect crafting table. 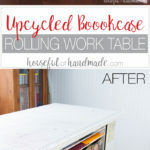 I can’t tell you how much I love my new upcycled bookcase rolling work table! 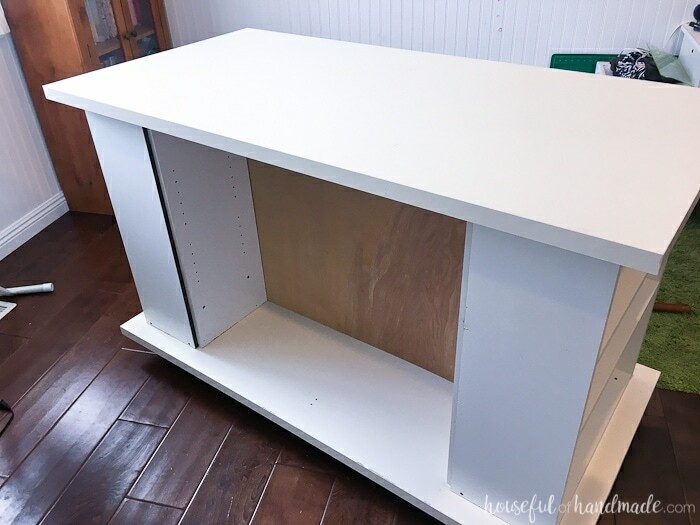 Since I made this upcycled bookcase rolling work table for the $100 room challenge makeover, I had to keep a close eye on my budget. I love the creativity this challenge is forcing me into. 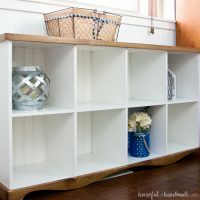 Luckily, we just did a huge rearranging in our entire house and it uncovered a lot of things that I didn’t want anymore, like a couple tables from Ikea we used for my kids art table and my old craft table, as well as 2 short bookcases and 1 tall bookcase. Instead of tossing or donating them, I decided to upcycle them into my dream craft table. Lots and lots of storage. Tall enough for me to comfortably stand at. Has wheels so I can access it from all sides, but push it out of the way when not in use. And I have to do it all for practically nothing because I am quickly spending my $100. The bookcases were the perfect answer to my needs. Now my table has so much storage I am not sure I will be able to fill it all. Okay, that’s a lie, I may be a bit of craft hoarder and I’m drowning in all kinds of crazy crafting things (not to mention the hoards of fabric). But at least it will all be organized now. With just a little bit of woodworking, and a piece of 1/4″ plywood underlayment (left over from the entryway makeover I really need to share with you), I was able to make this table for $0. Yep, you read that right. I spent absolutely nothing on this entire work table because I used things that I had, but no longer wanted. I am shocking myself with how I am able to create something from the junk filling the corners of my house (and seriously, these bookcases were just piled in the back corner of the basement hallway). And there is a lot more to come. There are going to be so many budget friendly ideas for this space, make sure to subscribe to the weekly newsletter so you don’t miss out on anything! 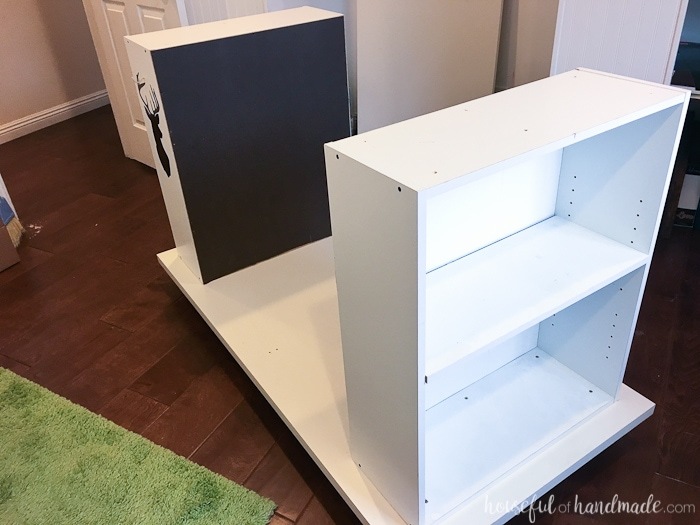 And if you are ready to see how I transformed these 3 bookcases and 2 Ikea tabletops into the best upcycled bookcase rolling work table ever, check out the tutorial below. You will be amazed at how easy it was! You could also use 3/4″ plywood for the top and bottom. Click here to see my favorite budget friendly tools. The height of my work table was super important, so I started by figuring out exactly how tall I wanted my table to end up. Then I subtracted the thickness of my Ikea tabletops (x2) and the height of my castors. The smaller bookcases needed to be cut down to this height. This meant I just needed to remove the toe kick on the front of the bookcases. And trim the side boards to be even with the bottom shelf with a circular saw. Before I started assembling the table, I attached the castors to the bottom of one of the table tops. I used 5 wheels, four on the outer corners (about 3 inches in from each side) and one in the center. To make sure they were stable with lots of use, I used a heavy duty construction adhesive to glue the castors to the bottom of the table. Then secure with screws. After the adhesive cures, they are not going anywhere. Turn the table top over. Now line up the smaller bookcases where you want them on the top of it. Attach them with wood screws through the bottom shelf into the table top. If you don’t have hoards of craft supplies, you can add your second table top and call it a day. But I need A LOT of storage if I want a room that is anywhere near organized. So I decided to add more shelves to the center of the work table. I took apart the 5 shelf (6′ foot tall) bookcase and cut down the two sides so they were the height of my smaller bookcases with a circular saw. Cut 4 of these from the two sides, make sure you cut them identically so the holes for the shelf pins line up properly. 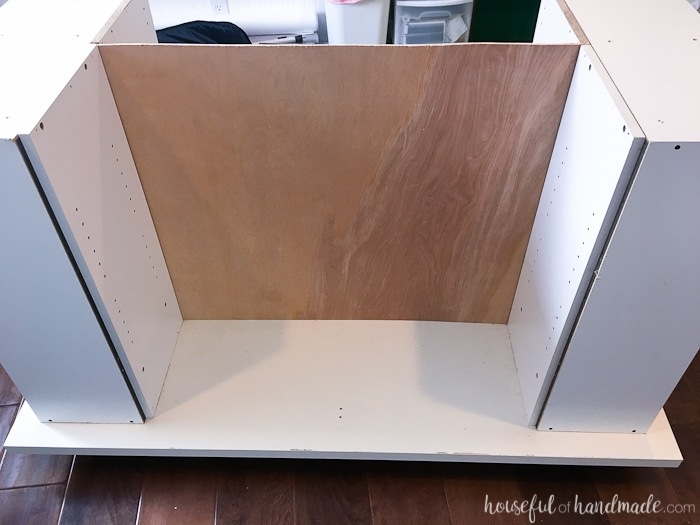 Attach two of the shelf sides to the back of the small bookcases. I set mine in about 1/2″. 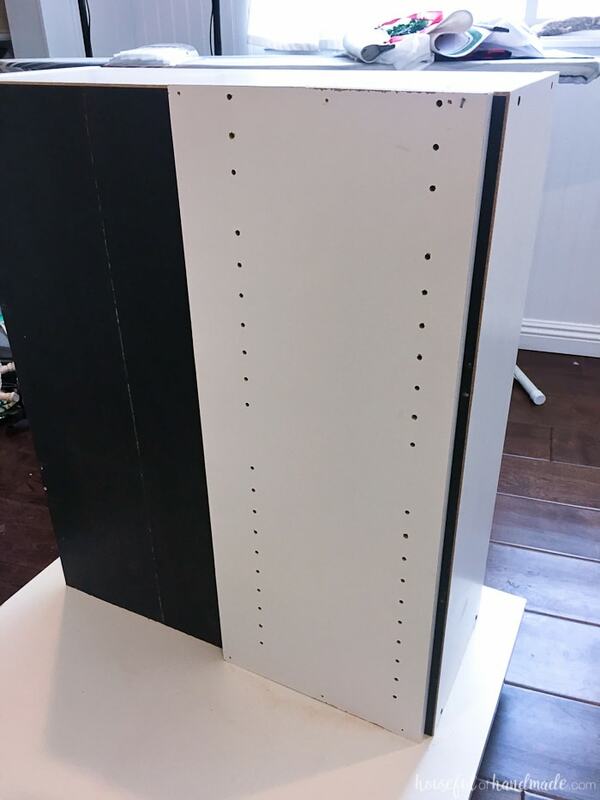 Make sure you are using the matching pieces of the bookcases so the holes for the shelf pins line up. I attached these with my battery powered finish nailer and a few nails on the top and bottom. 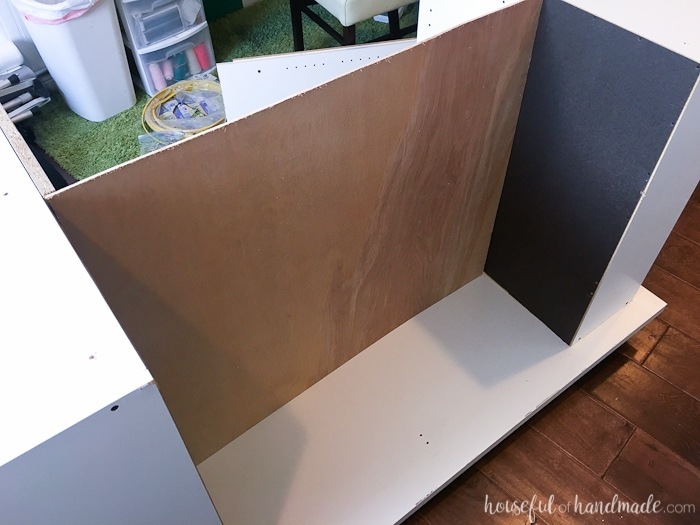 Cut a piece of 1/4″ plywood so it covers the back of this new shelf area. Place this behind the shelf sides. I didn’t bother attaching it, I just placed the second set of bookcase sides on the other side so it was contained in the middle. Now it’s time for the top. Line it up on top of your upcycled bookcases and secure. I used wood screws in through the top shelf of the bookcases into the table top. I added the shelves to the smaller bookcases. And then I realized the middle bookcase area I created was about 4-5 inches larger than the shelves from the bookcase I took apart. If I didn’t have a $100 budget, I would have purchased some boards and cut them to the right length. But when I went to see how much they were, they were $15 a piece. I needed at least 2 so that was definitely out of the budget. Luckily, I found a solution that cost me nothing! Using my Kreg jig and the left over heavy duty construction adhesive, I was able to create longer shelves from the shelves I had on hand. I cut one of the shelves into pieces that were equal to the amount needed to make the new shelf length. 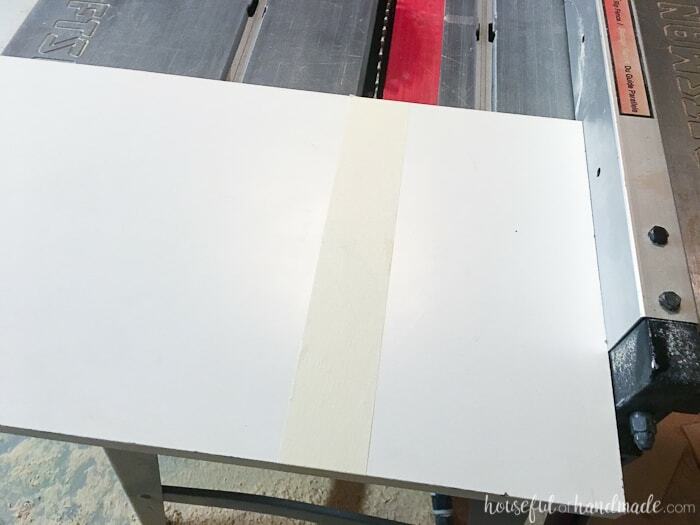 Place masking tape over the melamine shelf where you are cutting to prevent chipping. Add 4 pocket holes to the edge of the new piece of shelf. 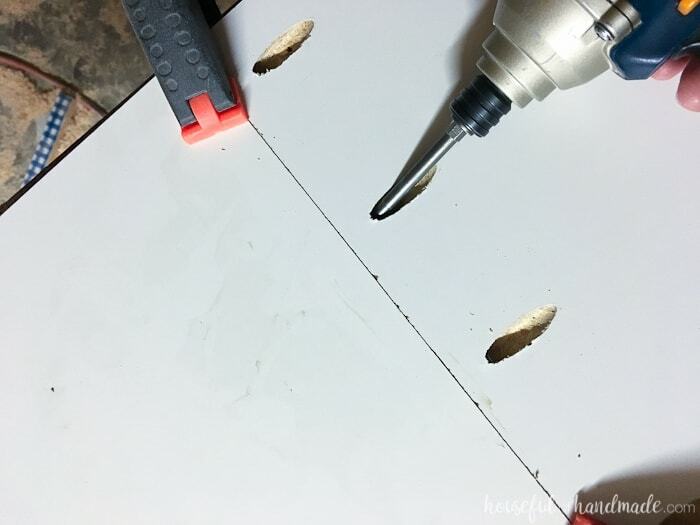 Run a bead of construction adhesive along the edge, then secure the two pieces together with pocket hole screws. Once the adhesive cures, the shelf should be good to use. Because these shelves have a seam, they will not be as strong as a regular shelf, I put all my heavy items on the bottom shelf (aka, the table top). The new, long shelves will be perfect for organizing all my other crafting supplies. And because they cost me nothing, I think that is a great solution! Now I need to spend a day (or two) completely organizing all my stuff into the new upcycled bookcase rolling work table. Lucky for me, the hubby and I are addicted to coffee so we buy our k-cups in bulk. 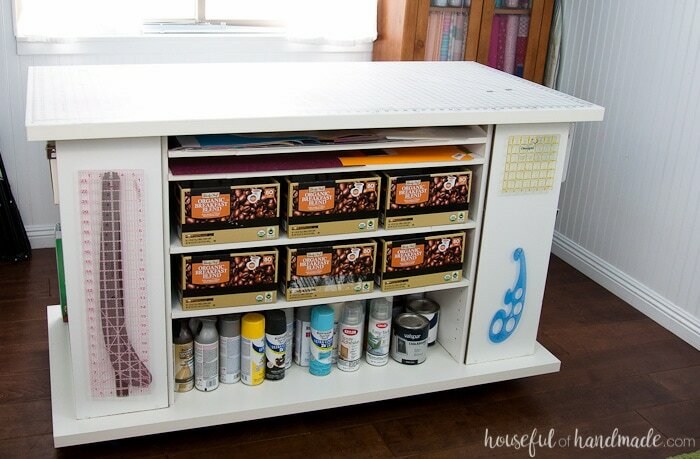 This leaves me with the perfect storage boxes for organizing all my things in my craft table. I just need to figure out how to pretty them up a bit! 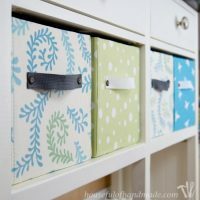 I love how the fabric covered storage boxes for my coffee console table turned out, maybe I’ll do something like that. 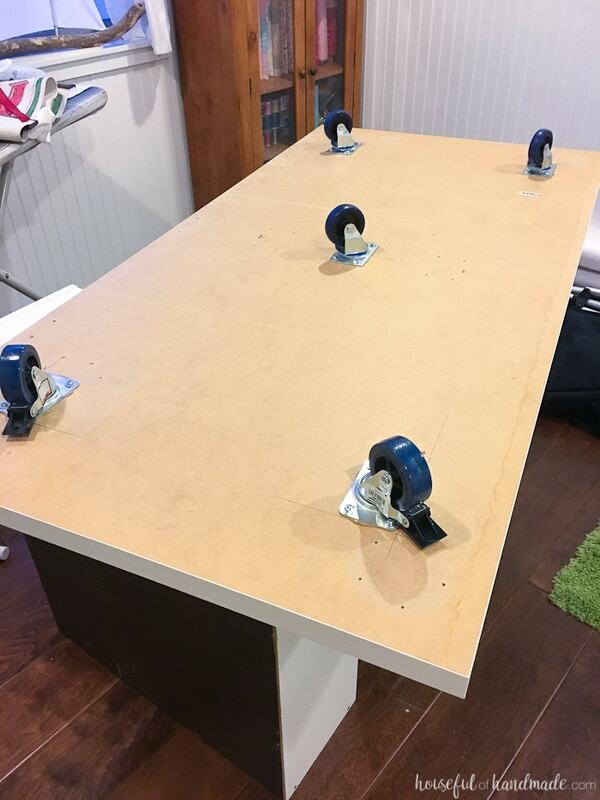 Also to make this work table really work for me, I topped it off with a large cutting mat. To keep it from moving around, I stuck it down with a few strips of double sided tape. It’s the perfect surface for cutting and crafting! The grid has really come in handy with lots of projects. Lastly, I used a couple screw in hooks on the sides of the bookcases to hang my quilting rulers and french curves. I love that these large items are out of the way but right where I need them. Seriously, this is the perfect table for my new office & craft room. And making it completely out of upcycled bookcases that were in the donate pile makes it even more perfect (if that is possible). I am considering doing a few things to pretty it up a bit more, but we will see if I have time after completing the rest of my enormous list of projects for this room. 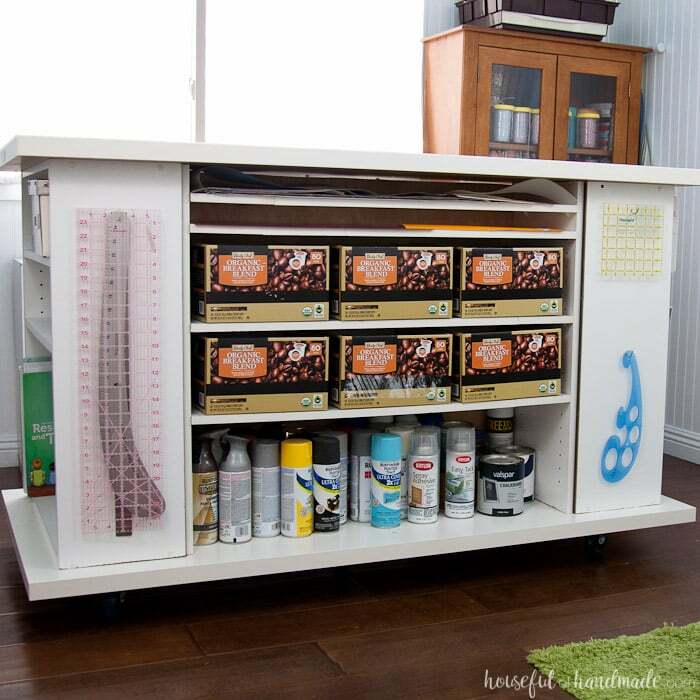 Don't let your craft room get out of control, keep it organized without spending all your money with these easy, budget friendly DIYs. Turn the space behind your door into usable storage! 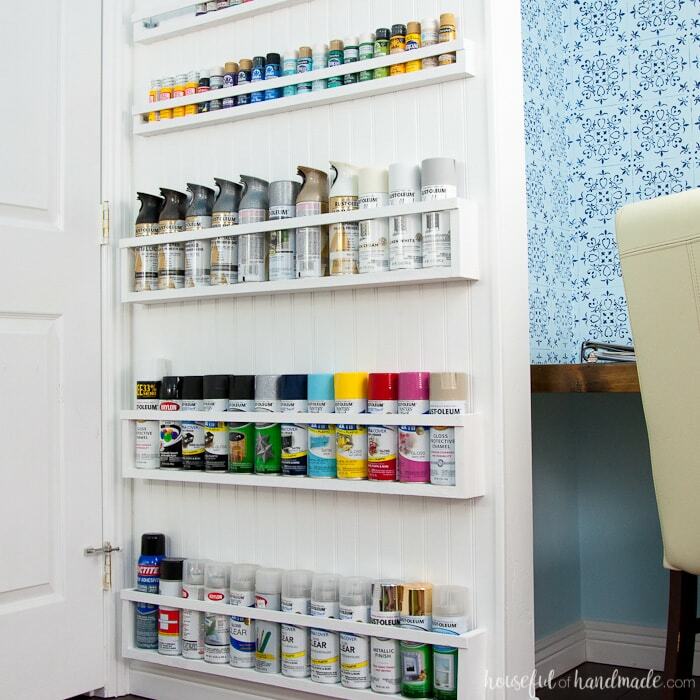 These easy paint storage shelves are perfect for organizing your spray paint or craft paint and can be made in just minutes. Keep your iron and ironing board off the floor with this easy DIY ironing board holder. 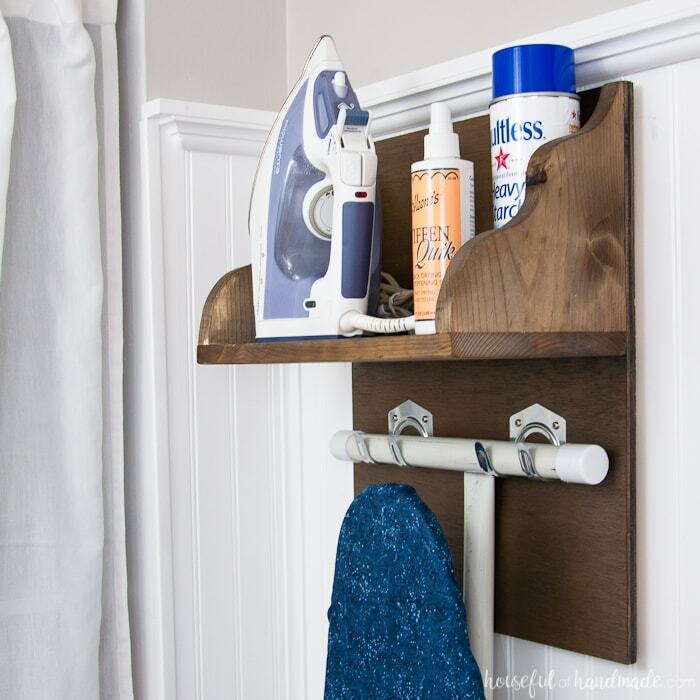 Make this easy iron holder out of scrap wood in an afternoon. These farmhouse wall vases are made out of recycled food jars and reclaimed wood. They are perfect for storing and organizing markers, pens and pencils in your craft room. Upcycle cardboard boxes to look like expensive fabric storage boxes! 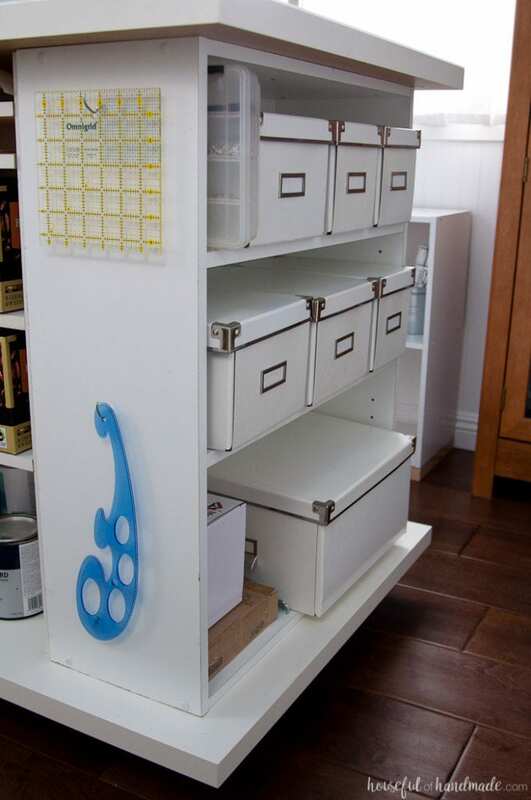 Perfect for organizing anything in the craft room. 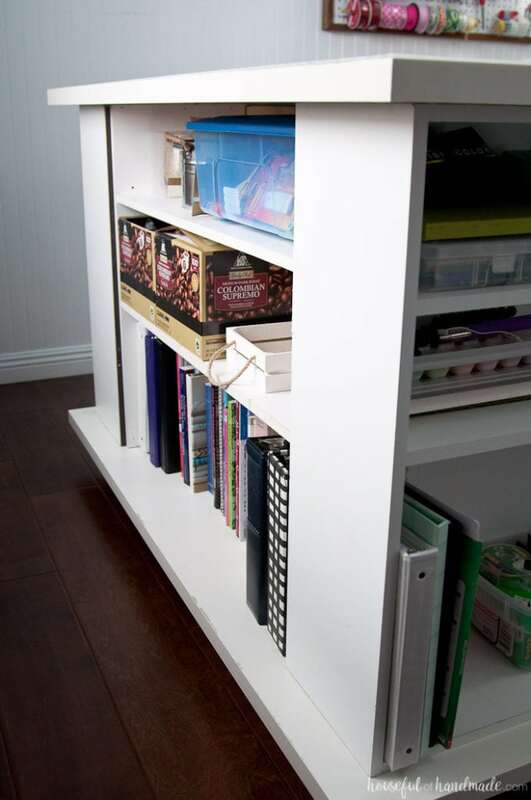 Got a boring cube bookcase? 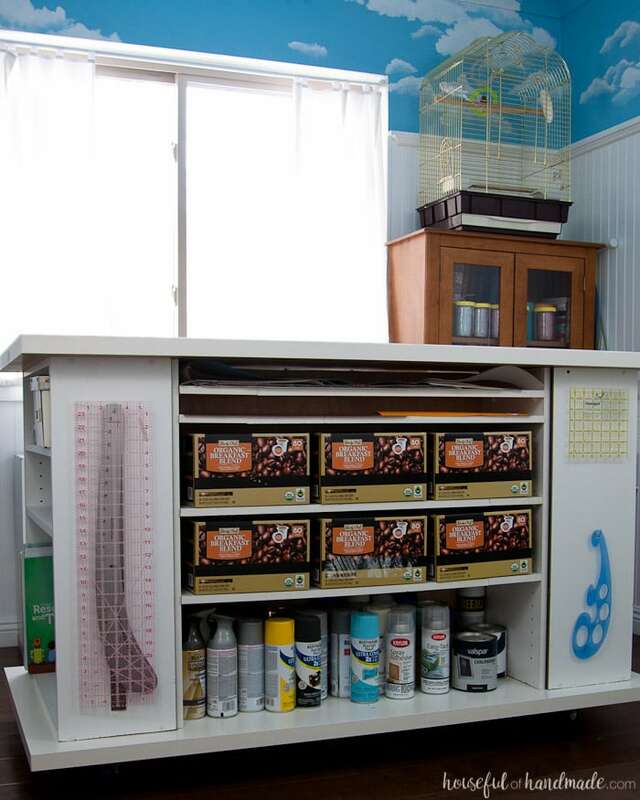 Turn it into a beautiful console to organize books, craft supplies, and more! 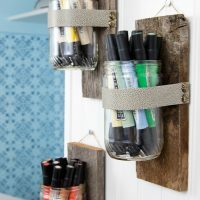 And it is a great budget friendly upcycle. 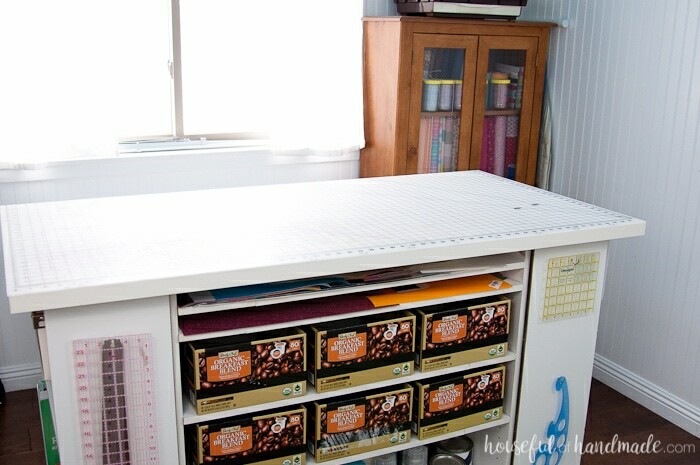 Love this idea I have 4 – 3 shelf bookcases that when rearranging my craft roo. Just don’t fit anymore but by doing this I get to keep them and get a work table. My room is so small this will help. Thank you for posting. Yeah! Usually you only find these kind of ideas after you get rid of them. Enjoy your new table! What cutting mat did you purchase? I am looking to build one of these based off of a good cutting mat. Thanks! I purchased mine at Joann’s many years ago, but it has held up to lots of use. There is no brand name on it. I had to cut it down at little to fit my IKEA top. I think the mat was 36″x60″ and I cut it to 28″x60″. Hope this helps! THank you I love love this and will attempt it. Is it possible to get a printable set of instructions? I joined your website but cannot find this project. This is a great idea! I do not have build plans as a printable but I have formatted the website so if you just hit print from your browser, it should take out all the extra stuff and give you a clean printed set of instructions. Hope this helps! Utterly brilliant! I’ve been going through things to sell locally since my girls are out of the house and mentally included six, 3-shelf, solid oak bookcases in that lot. Since I’m desperate for a place to organize craft supplies, I am SO thankful this popped up before I sold the bookcases! I am so glad you saw this before selling. I always tend to find things like this just after! 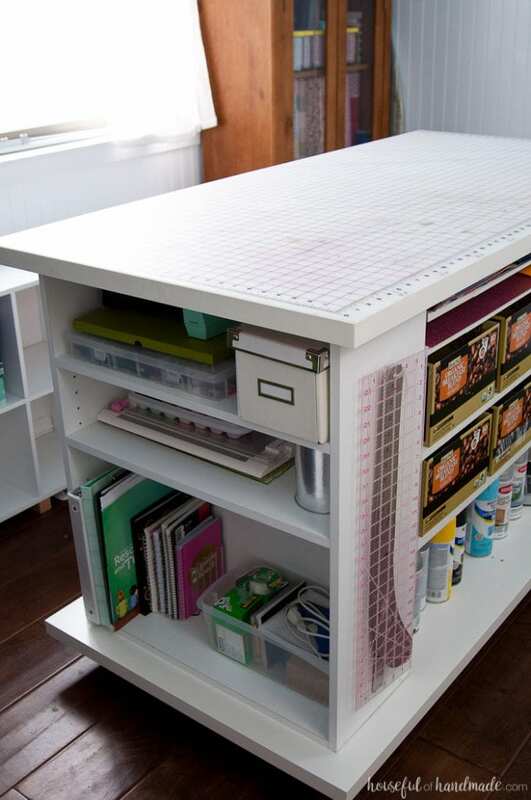 This table is the perfect place for organizing so many supplies. Mine is holding tons of stuff! There should be lots of pictures on the post. Check out the first page (at the very bottom you should see Page 1 2) if you are on page 2. Lovely project. I will dig out some of my old shelves and make something like this for my table saw :o) Your post was attractive and easy to follow, but the text was a bit hard to read. The font is attractive, but since it’s so light, would you consider going up a size on your next post? Thank you for sharing your project! Hello Kimee. Thank you, I love the idea for a table saw table too (I need more work tables in my garage). And I finally figured out how to update the font and made it one point bigger. Hope this helps! This is awesome! I love all the extra storage this gives you. Plus it is mobile! What a great idea. Thanks Jenna! I already have been using it so much and the wheels are my favorite part! Brilliant! I only wish I’d seen it before purchasing my current cutting table setup. HOWEVER, you’ve given me some terrific inspiration for changes I can make to improve what I have. Thank you so much! I am so glad you got some inspiration Suzanne. I’m sure your new cutting table will be amazing!